There are many things to think about when developing resources for the general public, including literacy level, language, images that engage the population of interest, etc. Designing resources about preconception, prenatal or child health brings up additional factors to consider. 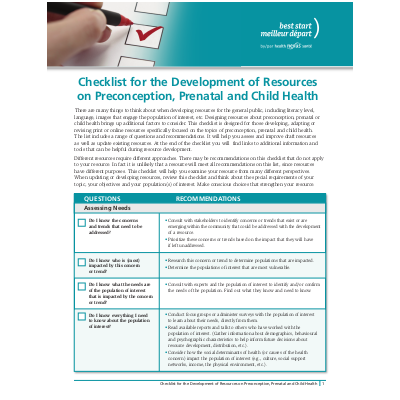 This checklist is designed for those developing, adapting or revising print or online resources specifically focused on the topics of preconception, prenatal and child health. The list includes a range of questions and recommendations. It will help you assess and improve draft resources as well as update existing resources. At the end of the checklist you will find links to additional information and tools that can be helpful during resource development.